See all the people dressed warmly? You may have noticed the Meet @ Malvern link on my sidebar~and wondered what the heck it means. 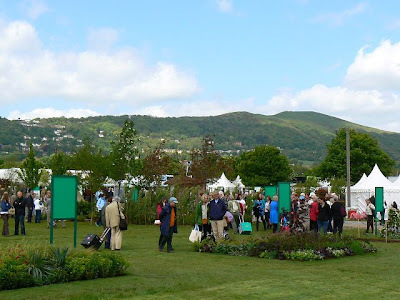 My dear friend Frances of Fairegarden fame and I are going to the Malvern Spring Gardening Show~ We'll get to see a tiny bit of England and attend a well respected garden show~It's the 25th anniversary and they are sure to put on a big time extravaganza. There are rumors that royalty will make an appearance...I mean more royal then James, Joe and Cleve! Ever since VP began talking about the Malvern Meet, Frances and I, knew we wanted to attend. We arrived at the decision independent of each other after much joking back and forth with VP and one afternoon while chatting via phone we committed to going. Am I ever excited about attending ...where I'm sure to see plenty of interesting garden designs and hear great presentations! 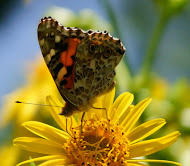 We'll also try to see a few local gardens and sites nearby. ...Maybe even brave those Malvern Hill walks. Almost every gardener I've ever spoken to has dreams of visiting England and touring the renowned gardens. This trip isn't about a grand tour! 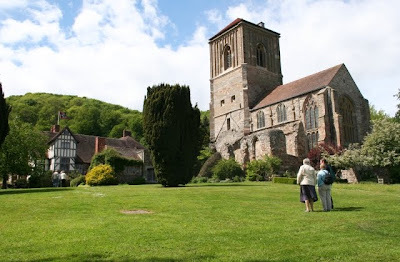 I'm going to Malvern to spend time with gardenbloggers. The Malvern Spring Show is sure to be exciting~ but, getting to meet bloggers face to face is the big draw! I am looking forward to meeting my friends VP, Helen, Victoria, Yolanda Elizabet, Karen and a host of other talented gardeners/writers/ from the UK and Europe. Bloggers whose wit, gardens and writing I've long admired. Hedge has nothing to do with Malvern...but doesn't he look lovely! Frances and I have traveled together before...We're great friends and we're ready for our Malvern adventure! After all, where else could Two Innocents Abroad ~~translation~two women of a certain age~see the likes of Three Men In A HaHa or be met at the airport by a man declaring in an email...that he would be "glad to pick up two innocent broads!" We expect to have a grand time and we don't care if the wind blows, the rain falls and we wear borrowed wellies the whole time! How very, very exciting! Can't wait to hear all about it! What a team! The next best thing to being there is reading the posts you two will compile. What a great adventure. Take your own wellies and umbrella. That way the gods will trick you and have beautiful weather and you can whine that you shouldn't have packed them. FUN fun FUN. Gail - you don't know how gooey your post has made me this morning. Published whilst you're still fast asleep and dreaming of the fun we'll have in May! The clock is still ticking away in the Countdown on the blog - so it's not long 'til I'll actually see you and Frances - Fantastic! Amazing how those initial jokes and larks have turned into something so real and exciting isn't it? Looking forward to meeting you and Frances Gail. 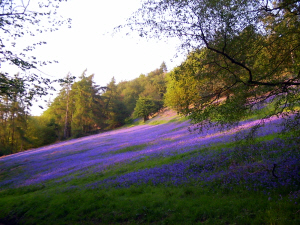 Malvern is truly magical and I am sure that you will have a great time come sun or rain. what a dream, a vacation centered around gardening. Oh, this sounds like so much fun! Can't wait to hear all about it. H.
Oh dear! Sounds like Thelma and Louise, lol...I cannot wait to read your takes on this adventure...the fun you will have! I know you will both have a wonderful time and we will be so excited to go along with your posts! Please drop by and name the plant that came with the PPPP that you sent me.. Looking forward to meeting you and Frances, might not be a grand tour but we can certainly do a mini tour of gardens one day if you would like. Can you let me know if you will need picking up from Malvern station on the Thursday and if so what sort of time you think it will be as I need to plan my visit with my other half to the show. Have fun! I've been to London and Calais but not to visit gardens. Should be interesting. Very exciting Gail! Have a great trip and be sure to take lots of pictures! - Somehow I don't think I had to tell you that! How exciting, Gail! I saw the photo and comment in your sidebar some time ago and meant to ask if you were going--what a wonderful time you and Frances will have! I can't wait to read the posts about this experience the two of you will have. I am secretly envious, but this year I'm not even sure I'm going to be able to make it to Buffalo, let alone Malvern. So I'm looking forward to experiencing this vicariously through your posts. Have a marvelous time! I would so dearly love to visit England. The English style garden has always been my ideal. It took me years to finally learn that English gardens only exist in England. They don't do will in the northern midwest. Buy several photo cards 'cause we are gonna want lots of photos from you lucky gals. Oh you gals are going to have just the best time! 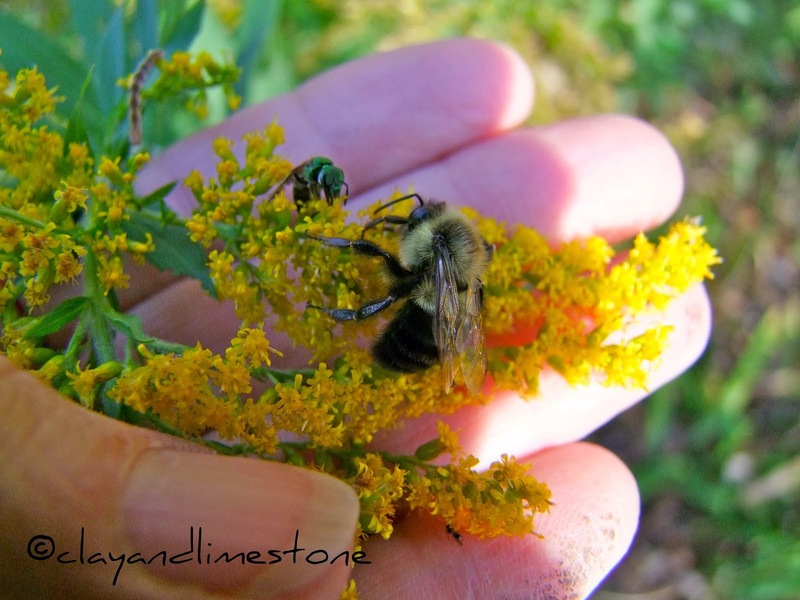 Think of all your garden blogging buddies back in the U.S. while you're ooh-ing and ah-ing over the greenness! Can't wait to hear all about it. "vary" instead of "very"? No idea where that came from! Here's to wishing you two innocent broads the trip of a lifetime! Really looking forward to seeing the pics and posts from the Malvern adventure. I traveled to London for the Chelsea Flower Show and a few of the RHS gardens with one of my dear friends a few years back. It was one of my most favorite and memorable vacations. I'm feeling so excited for both of you! I am green from envy! Well, good type of envy. I've been at the Chelsea Flower show and it was a lifetime experience, but just seeing vivid English green colors and white sheep on the pastures was making me happy too! What a great trip you are going to have! Will wait for your posts! I wish I could go too. I would so love to meet the bloggers you mentioned among others. (The only consolation I have is that I'll be seeing you & Frances in July.) Can you get me autographs of Joe, James & Cleve? I'm a big fan of 3 Men. I'm excited for you and Frances getting to go together. It's going to be so fun and I can't wait to hear about it. Gail (and Frances) -- How wonderful! I am sure you girls are giddy with excitement. We expect LOTS OF PHOTOS and LOTS OF STORIES about your adventure! Gail!! How exciting not only to travel to England and see this garden but to meet some of your Europeon garden blogger friends!! Give Yolanda a big hug for me!! Happy trails to you have lots of FUN!!!! Wow Gail! That sounds exciting. I've always drooled over photos of Royal Gardens. You both have fun and get us lots of photos! Happy and Safe Journey! I am glad you are not putting off your dreams for "someday." Oh, I am so envious of you, have not been in England for 4 years now, and miss it dearly, I need a fix!!! So looking forward to reading about your and Frances' adventures. Just don't be pulling a Thelma and Louise on us, lol. You're going to England?! -- I thought you were going to Maryland or something. Wow. I'm envious. What wonderful fun you'll have! England is in my blood (my father was born there) and I long to visit the UK. How exciting to be meeting blogging friends and to see some gorgeous English gardens. We'll tag along via your photos and stories. It's the next best thing to being there! Your viewers will be demanding lots of photos and commentary, at least this one will. I hope you & Frances have the best time ever. I think it's great that you 2 are going together. Gail, I'm certain you and Frances will have a great time together! I'd love to meet bloggers in person!! Looking forward to your reports!!! Enjoy! Hi Gail - I'm sure you'll enjoy your trip over here - If you are meeting up with VP and co I'll probably catch you too! I am sure everyone will be wearing sun hats and sunglasses this year. Over here we remain eternally optimistic about the weather while simultaneously packing an umbrella just in case! Yea, that sounds wonderful, Gail! May is a great time to visit England...anytime is a great time to see friends. You'll come back invigorated and grateful, for having the experience and for coming home. What a fantastic trip! I can't wait to hear (and see) all about it! Gail, I must add my well-wishes to everyone elses. May you Innocent Broads have the time of your life! Just make sure you get it all documented and I know you will share your adventures with us. I just wonder if England is ready for the two of you unleased on the UK? ;-) Ready or not, here you come! The only thing better then getting to go on this trip, would be to go with a good friend. Have the most wonderful time together. Take millions of photos, share with us. Wow! What a fantastic journey, and good for you and Frances for making it happen. I am envious and want to hear ALL about it when you get back! Looking forward to meeting you and Frances, and hoping that the British weather does what it can do occasionally - give us all a wonderful surprise. I know you'll have a FABULOUS time! I've trooped off on two solo self-guided garden tours in England (following conferences) --totally great fun -- but found myself talking to perfect strangers about cool things I've seen, so what fun to be in the company of garden bloggers! Ah, Gail, the two of you together in Malvern will be a dream. So happy for you and how lovely to meet up with bloggers across the pond. It will be kind of fun to wear wellies if their rainy weather keeps up. I am looking forward to living your adventures vicariously. Have a wonderful trip and take lots of notes and photos to share with the rest of us. I'm going with you, vicariously. I anticipate a delightful report. Oh Gail, this is too good. You are going to have an AWESOME time! I'm jealous because yes, I'd love to visit anywhere in England someday too. It will be all the merrier traveling with such a good friend. Can't wait to hear about it and see the photos.